Earlier this week, a friend of mine posted an article on my Facebook page about how coloring can be really good for adults. I then posted the article on The Spinsterhood Diaries Facebook Page, and I believe a few of you quite liked it. So, of course it followed that I should make a coloring page at some point this week. 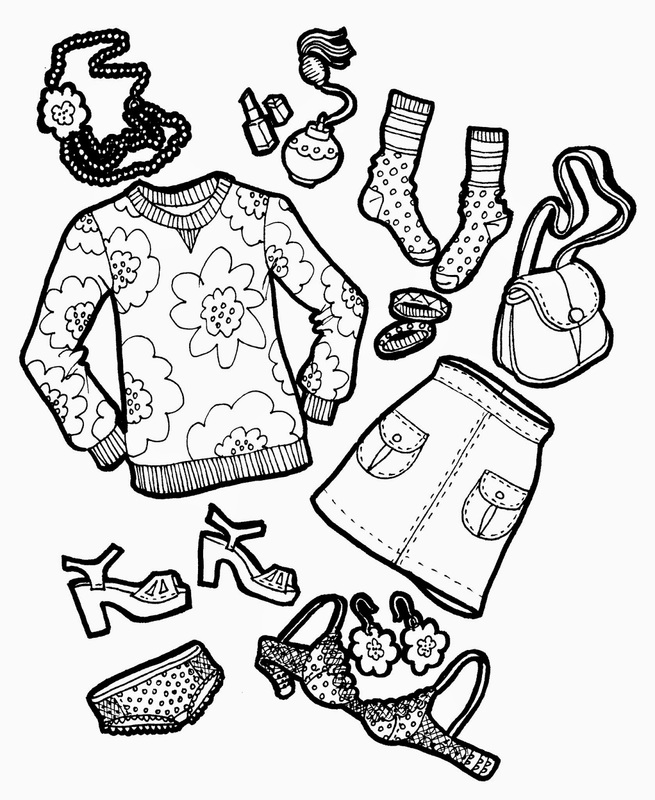 Today's coloring page is all the components of an outfit. At least I think In remembered everything. Just inc as, though, let's discuss the items included in this coloring page. This whole outfit revolves around a sweatshirt I loosely based on one I saw at the Marimekko store when I was in New York. It was so cute, but I couldn't bring myself to spend $175 on a sweatshirt. Above the sweatshirt, you'll see a matching necklace. Next, there is some lipstick and then a bottle of perfume with one of those atomizer bulbs. When my sister and I were little, we really wanted perfume that came with a squeeze bulb. I'm nearly thirty, and I still think I'd feel fancier and more glamorous if I put my perfume on this way. Next to the perfume is a pair of wacky socks because if you're going to wear socks, they should be exciting. Beneath the socks is a pair of bangles, and next to the bangles is a cross body purse. They're just easier to carry. Below the purse is a skirt I would very much have liked to wear every day when I was a slimmer girl. Unfortunately now I'm fairly sure it would accentuate the fact that I generally look like I'm smuggling a sack of flour over my belly. You're welcome for that visual. Under the sweatshirt is a pair of clogs because they're cute and comfy and look cool with socks. And Below those are a pair of undies based on the Aerie Mini Boy Brief with matching bra because, you know...sets (as if anyone wears a matching set on a regular basis.) Lastly, above the bra is a pair of earrings with the floral design from the sweatshirt and the necklace. So, if you have a hankering for some relaxation and stimulation of your motorskills, print out this coloring page today and go to town. Enjoy!